In early July when President Donald Trump imposed trade tariffs on imports of commodities including steel and aluminum, the nations singled out by Trump, including China, Canada, Mexico and the EU, struck back, targeting food producers across the U.S. with stiff retaliatory tariffs on exports of corn, soybeans, wheat, cotton, sorghum, pork, poultry, fish and a number of nuts, fruits, vegetables and other agricultural products including bourbon, orange juice and dairy products. In an attempt to alleviate the economic impact to farmers as a result of his own trade policies, President Trump on July 24 promised $12 billion in emergency aid to farmers, using a depression-era assistance program to put a band aid on the immediate pain American farmers are feeling as a result of the U.S. imposed tariffs and subsequent trade retaliation by China, the EU and others. Sen. John Kasich (R-OH) said that President Trump was resorting to “farm welfare” when what American farmers really want is the administration to stop imposing tariffs. American consumers will feel the pinch both ways under the proposed bailout strategy in the form of higher costs for foods due to the higher tariffs, and also the $12 billion emergency aid for farmers will end up coming from U.S. taxpayers. In a move that could provide some relief to U.S. soybean producers, President Trump on July 25 announced a deal with EU President Jean-Claude Juncker that would remove tariffs on a number of industrial goods in trade between the U.S. and the EU. In a hastily scheduled joint press conference on the White House lawn, Trump declared that European countries would be buying “a lot of soybeans” from American farmers. In a campaign-style speech on July 26 in Iowa, Trump told a group of farmers, “We just opened up Europe for you farmers. You’re not going to be too angry with Trump, I can tell you,” he said. However, existing tariffs still remain in place and the U.S.-EU announcement did nothing to resolve Chinese sanctions on U.S. soy, pork and other farm products. In response to Trump’s trade tariffs, China in early July imposed a 25 percent tariff on U.S. soybean exports and also placed tariffs on U.S. corn, wheat, sorghum, pork, beef, nuts, fruit, vegetables and many other agricultural products. Mexico is also levying a 20 percent tariff on U.S. pork in response to Trump administration trade sanctions, as well, Agri-Pulse reported. “Patience is wearing thin on U.S. pork producers because the next six months of market prices – there’s a lot of red ink. We need the administration to come to these deals quickly,” Iowa hog farmer Gregg Hora told ABC News. According to Bloomberg, agriculture is the third-largest U.S. export industry. American farmers export approximately one-third of their annual production. 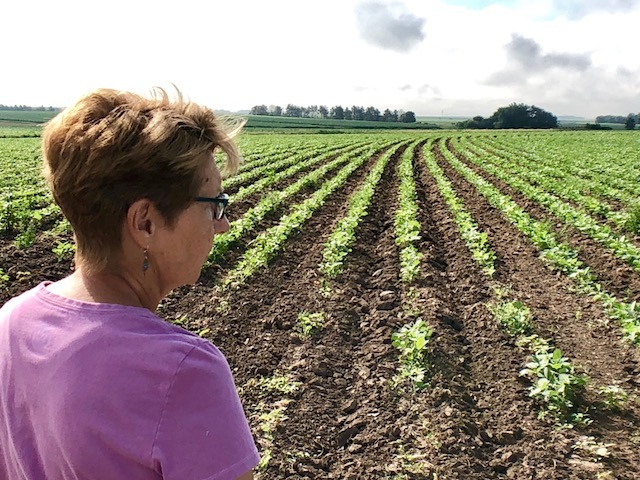 According to Bloomberg, that generated an estimated $21 billion trade surplus this past year, however, that is now under threat after China imposed tariffs on U.S. soybeans and other agricultural products. But farmers are not the only ones affected by the administration’s trade wars. Packaged goods manufacturers, too, are beginning to feel negative effects. When the Trump administration placed tariffs on Chinese goods with an annual trade value of about $200 billion, roughly 1,300 products were impacted. The additional taxes will ripple through supply chains, reports CNN Money, compelling businesses in the U.S. and China to decide whether to absorb costs or raise consumer prices. CNN Money published a list of food products impacted by the trade tariffs here. Eater also published a list of foods subject to tariffs, by country, here. “While selling maple to Canada is like selling ice to Eskimos, we do sell some maple syrup and maple sugar to manufacturers there. We will lose a little under $1 million in sales. The bigger issue for us will be the U.S. withdrawal from the TPP. Unless this is reversed or another agreement completed, we will lose close to $9 million in sales. “One more trade issue for us is CETA, the EU-Canada Comprehensive Economic and Trade Agreement. The tariff on Canadian maple is gone while there is still an 8 percent tariff on U.S. maple. This has essentially taken us out of the EU market with a loss of $4-5 million in sales. I doubt that we will have an agreement with the EU in the near future. With many nutritional product manufacturers sourcing ingredients from China and the world over, supplement makers are feeling the pinch of a 10 percent to 25 percent import duty on a range of ingredients including minerals, animal and plant proteins, sweeteners, hemp seeds, phytosterols and other ingredients. According to Natural Products Insider, online trading resource IngredientsOnline.com has complied a list of more than 180 ingredients that could be affected by the trade tariffs. "Keep in mind this is just the beginning; we're hearing the tariffs can range from 10 percent to 25 percent. It's obvious this will have a tremendous effect on not only the industry but on consumers as well,” said Peggy Jackson, VP of sales and marketing for IngredientsOnline.com. Among a list released in July of Chinese goods facing tariffs of 10 percent or more were a number of specifically named herbs and botanicals, as well as what American Herbal Products Association President Michael McGuffin described as a “catch-all” category that could include a number of herbal ingredients and a separate designation that could impact certain forms of minerals used in dietary supplements. In addition, importers may choose to buy up raw materials before tariffs take effect, and “all of a sudden the supply-demand equation is no longer balanced and the costs are going to go up,” McGuffin told New Hope Network. Robert Leonard, News Director for Iowa radio stations KNIA and KRLS, claims in a New York Times Op-Ed that President Trump’s trade war will hurt farm business at a time when the rural population is aging, and that it could accelerate the hollowing out of farm communities. “Mr. Trump recklessly opened trade wars that will hit ‘Trump country’ – rural America – hardest and that have already brought an avalanche of losses. Indeed, the impact of his tariffs will probably be felt by family farms and the area for generations,” he wrote. This article originally appeared in the August 2018 edition of Presence Marketing News.